Brands are starting to realize how mobile apps can improve the brand experience. Enterprise mobile development, the strategy and integration of mobile applications based on devise capabilities and user expectations, is becoming part of brand strategy. Applications that aid us in doing our work are providing a brand experience outside of the workplace environment. In the aviation industry, airports, airlines and hospitality companies will benefit from understanding the when, where, and how of creating engagement and deployment apps that increase customer loyalty. Not long ago, QR (quick response) codes held the promise of integrating print advertising with the online experience. Large consumer brands jumped to add QR codes on packaging and point-of-sale materials. The strategy was based extending the engagement leading to an action or a monetary transaction. B2B companies also started to add QR codes to their advertising but failed to consider the amount of time and resources needed to create meaningful content on the back end of the QR code transaction. All of this resulted in a hit-and-miss user experience. Contrast this with the emergence of NFC (near field communication) chips that are being embedded in Samsung smart phones running Google’s Android operating system. NFC technology is a communication protocol and data exchange format that is based on existing radio-frequency identification (RFID) standards. NFC builds upon RFID by allowing two-way communication between app and NCF tag. All these are done by swiping your smart phone in close proximity over the TecTiles. 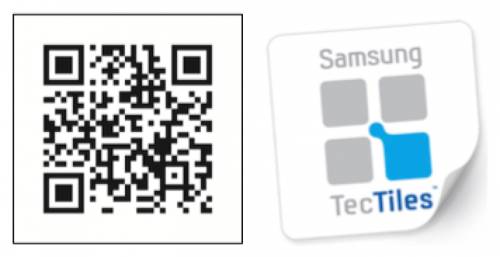 This is a disruptive technology for QR codes based on standardization of application and chip contained in an open source operating system for mobile devices. Airports, airlines, and the hospitality industry should consider implementing NFC branding in situations where TecTiles are in close proximity to customers. This technology holds the potential to enhance the user’s experience, increase brand loyalty, and extend the functionality of the brand outside of the intended workplace.